Before Steve Ballmer even announced the "One Microsoft" reorganisation, he'd started talking about Power BI as a key product for the company because of the powerful natural language queries. You can just type in questions like 'monthly sales by category' and receive charts ready formatted for you. But Power BI has been tied to very Microsoft ways of working – Excel, Silverlight and SQL Server. That's changing in the new release which has just been unveiled, says James Phillips. Six months ago Phillips, the co-founder of NoSQL database Couchbase, became the general manager of "data experiences" at Microsoft, taking over Power BI – that's the third leg of Microsoft's data story alongside SQL Server (which he once competed with at Couchbase) and the SQL Azure version, and Azure ML (the machine learning service for working with your data). Put them together and the Microsoft data strategy is a "simple promise" Phillips told TechRadar: "For every byte of data that enters the Microsoft data platform – whether it enters through SQL Azure or through a connection to a database on-premise – that will be exposed as a collection of value. You can do machine learning on it, you can build apps with it, you can do business intelligence on it. We're pulling it all together and allowing customers to wring value out of every piece of data they put into the platform." The difference from previous generations of BI isn't just the tools – it's the idea of what data you can get intelligence from, and how much of a technical expert you have to be. "The first-generation was technical business intelligence for the data professional, the database admin who understood OLAP models and cubes of data," he explains. Microsoft has done very well in that market: "We're the unit leader – there are more cubes running our system than any other product on the planet." But times have moved on. "The second-generation is the move to self-service BI; that's where you've got Excel, you've got Tableau – you've got solutions a business analyst can pick up and use. You may not know OLAP, or be able to install a database, but you can get value out of it and create analytical reports." The new Power BI Designer software for creating visual reports is obviously designed to compete with Tableau, which Phillips calls "a solution that's very focused on meeting a smaller need" than Excel, which he notes offers "unbelievably powerful ad hoc analysis". He views both Tableau and Power BI Designer as tools to use alongside Excel – "I've yet to meet a Tableau user who does not also use Excel." Power BI Designer will be free too, "because arming business analysts with tools to model and visualise data should not cost an arm and a leg". That's another indication that Microsoft is gunning for Tableau in this release but Phillips says the opportunity is far bigger than that. "I think we're entering a new generation of BI. Think about services like IBM Watson Analytics or Salesforce analytics cloud. It's the move to finally allow business users to adopt BI without being technical professionals. That's where we are putting all the wood behind the arrow." The big change is that so much data is now going into cloud services that BI can also finally become a cloud service. "Businesses have their data in Salesforce, in Marketo, in Mailchimp and so on. So we're finally able to deliver a BI solution as a cloud service, because they have adopted services where their data is accessible to them." 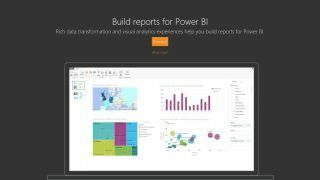 If you use Salesforce or Marketo or Zendesk or GitHub or SendGrid (or Microsoft Dynamics CRM), you can open your data in Power BI in just a few clicks, and get a set of pre-built dashboards that you can use or configure the way you want them – and Microsoft is working with other services to get them connected (the next few will be Inkling Markets, Intuit, Microsoft Dynamics Marketing, Sage, Sumo Logic, Visual Studio Application Insights and Visual Studio Online).